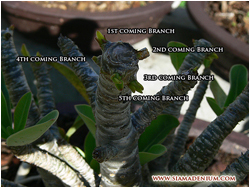 Making Symmetric Branches by "Sunlight"
I would like to share a new technique to help making Adenium branches become better symmetric form following with Bonsai Class by using the sunlight’s direction instead of leave cutting. Leave cutting was the old way to control the form mostly used with Arabicum. This is just to stop getting longer branch in a short term and not only make caudex slower growing but also root won’t be spread more because of less photosynthesis come from leaves. Here below is the new technique to make nice branches with symmetric form. mostly aged about 4 months. This is very important thing to begin. You should select the seedling comes up with multi-branches. Each side branch should be symmetric with 4 angles or same level. 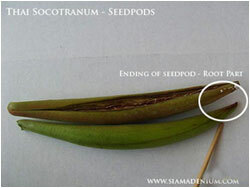 The most important thing seedling must have is the middle main branch surrounding with side branches. 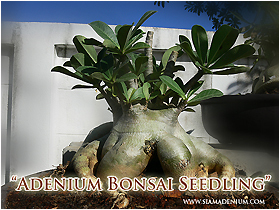 The middle main branch will represent the perfect form on top part which will help branch to be complete with the Broom Bonsai style most popular Adenium seedling form in here now. Root is hardly considered during this time because it’s under media so you should focus on top branch form first. After growing these seedlings for 2-3 weeks, we need to repot them with new media. The good characters of root must be spread around caudex. 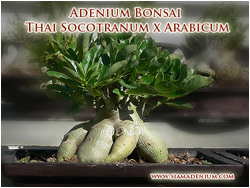 The Adenium hybrid always shows this root form is “Thai Socotranum” or “mixed hybrid” from Thai Socotranum x Arabicum. 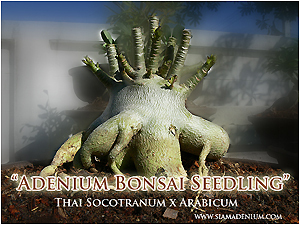 The special characters of this hybrid are root spread and symmetric branches. From my experiences, I have found that only 60% of them have nice natural root. For the rest of 40%, we need to organize them with other techniques like wiring, pruning, root grafting, etc. to make them spread out with 80 degree from caudex. We need to make media like mountain. You need to push the media until it’s tight because this will navigate the roots grow in side direction, not dig down to the bottom of pot. 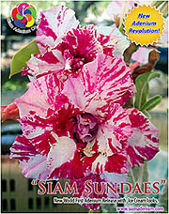 Cover the roots with same media about 1.5 inch height. We should organize the roots every 3 month by repotting and changing media. This will help seedling produce many more roots, spreader and faster. 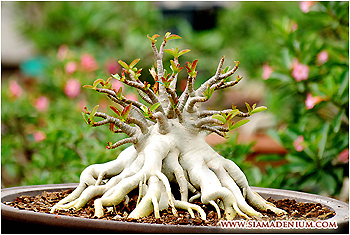 You can easily notice that Adenium with multi-branch form mostly have more roots especially fibrous roots. Now it’s time to work on branch to get symmetric form. The symmetric branch form is consisting of middle main stem and side branches. We can use the sunlight direction to control their branches. We will rotate the pot and point the short branches to hit with the full sunlight direction. If the middle main branch is bend down you can also use this technique to help them go straight up (Please see the photo). This is simple technique from nature concept which help seedling get better form. Arabicum because their branches can be easier distributes than Arabicum. 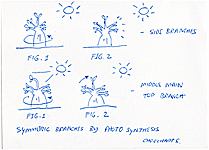 These new Branches will be consistent like nature in 4-5 months (Please see the photo). The topmost Adenium seedling’s growing is not only growing her in the right way but also better knowing their hybrid characters. The funniest part for Adenium form player is to make bad form to the best one. Questions or comments, please feel free to email me. Have a nice day.